Home » Blog » Olive the Sheep’s U.S. Tour! Eighteen months ago, I got an email from Karen Boss, an editor at Charlesbridge Publishing, inviting me to work on an exciting new project. 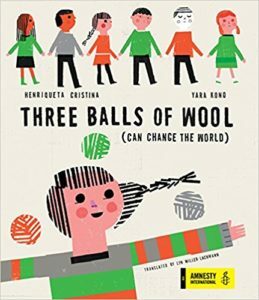 It was a book for young children, originally published in Portugal by Porta Editora, that combined both a bedtime story and a noted psychologist’s advice for parents and caregivers. Because I translate not only children’s books but also academic articles in the social sciences, I was the ideal person to work on this project. The result, Olive the Sheep Can’t Sleep (in Portuguese, Olívia, a Ovelha Que Não Queria Dormir), by Clementina Almeida with illustrations by Ana Camila Silva, is making its U.S. appearance on Tuesday, August 7. Olivia is an active little lamb who spends her day running around the farm with her friends – a cow, a cat, and a dog. But while these other creatures have no trouble getting to sleep at night, Olivia insists on staying awake, and her antics threaten to keep her parents awake as well. But they have a secret weapon – a bedtime routine that the book invites parents to follow in a subtext that accompanies the main text to be read to the child. An extensive afterword offers additional tips, from maintaining a consistent bedtime to taking out the television and tablets and avoiding the use of the bedroom as punishment. Our friends in Portugal have used the book and its techniques, and they swear by it. (Olive is a bestseller in Portugal and I’m amazed that no licensed stuffed sheep are on sale to accompany the book.) Unfortunately, the grandparents, like many grandparents everywhere, fill up their little one with sweets and let him stay up late, thus disrupting his schedule, and it takes a day or two for them to get back on track. If you are a parent who has the same problem, perhaps this would be a good book to get for your parents, so that a copy, with its familiar story and its advice on bedtime routines, stays with grandma and grandpa. My husband and I didn’t have this book when our own children were growing up, and I still remember the endless bedtime stories they requested and their demands that we stay in the room until they fell asleep. Sometimes my husband fell asleep before they did, and I would peek in to see a child playing over his somnolent body. At fourteen months, our daughter climbed out of her crib after we left thinking she was already asleep. She crawled into our bedroom, as she wouldn’t walk for another three months. At the same time, our children never crawled into our bed. That was the line we drew, and they never crossed it. My cousin’s children, though, piled into their bed, and it took until the oldest one had turned eight that the children slept in their own rooms. None of the adults in that family got a lot of sleep for a very long time. This small sheep is a toy we bought for out dog but it’s good company for the book. 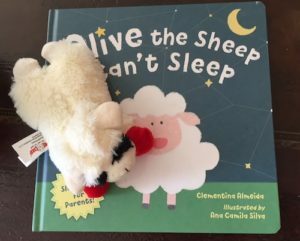 Because Olive the Sheep is a fictional character, she can take her U.S. tour without worrying about another sleep problem: jet lag. For those of us, young and young-at-heart, who do a lot of international traveling, jet lag is a common challenge, and on a short trip, it can leave the traveler running at half-speed for days or for the entire trip. With my extensive travel experience and my difficulties adjusting to new routines, I can recommend some of my most effective tips for reducing the time lost to jet lag, but that’s the subject of another post. This week belongs to Olive the Sheep, and I hope her U.S. tour turns out to be as fun and successful as her time with her animal friends on the farm in Portugal. Thanks, Lyn! 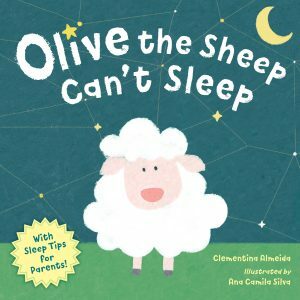 OLIVE THE SHEEP CAN’T SLEEP looks like an adorable–not to mention, eminently useful–book. Any chance it will be translated into Spanish and other languages? I don’t know about translation into any other languages. The book came out in Portugal in 2017, so it’s still early. That book looks so adorable, Lyn! I hope you’ll come on the blog and talk about your book translation work.